A lot of items have been found since custom heads became a thing. But from one person to another, or one google doc to another, things get lost and it gets a bit frustrating trying to sift through and find them all. 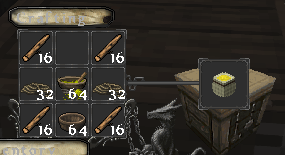 So for the known recipes and drops, I'll be starting a thread to list them and slowly update it with an outrageous amount of images of crafting tables... Bear with me. I'll do it in sections and be claiming several posts below this. It won't all be done in one day but the 'Drops' section is the easiest. Note: the item quantities don't matter unless stated. Just easier to screenshot in creative. Nine bread, filling the crafting table. Bread surrounding a white/brown mushroom. Bread surrounding a water bucket. I updated this one. Three cakes, any placement. Apple-Apple-Apple top, Sugar-Egg-Sugar middle, Wheat-Milk-Wheat bottom. Sugar-Wheat-Sugar top, Cocoa-Milk-Cocoa middle, Cocoa-Cocoa-Cocoa bottom. Sugar-Milk-Sugar first row, Wheat-Wheat-Wheat second row. (Gold Plate = Weighted Pressure Plate(Light)) Cookies fill top and middle row. Gold plates on the bottom. One bread surrounded by Sugar. Lapis-Lapis-Lapis top, Sugar-Egg-Sugar middle, Wheat-Milk-Wheat bottom. Melon-Melon-Melon top, Sugar-Egg-Sugar middle, Wheat-Milk-Wheat bottom. Nine pumpkin pie, filling the crafting table. Six cakes in a questionable heart shape. I updated this one. Three mushroom soups. Any order. 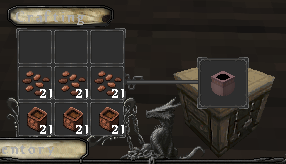 Iron ingots in the shape of a cauldron, Red mushroom on top and brown mushroom on bottom. Baked Potato-Bread-Baked Potato top, Bowl-Cooked Fish-Bowl middle, bowls on the bottom. Two apples, two melon, and sticks. Two pieces of wheat in top and middle surrounded by string. Carrots on top and middle, sticks for the rest. Apples on top and middle, sticks for the rest. Fern half surrounded by string. Clay balls on top and bottom, with gold nugget and sugar in the middle. Iron trapdoor middle with three blue orchids below. Iron trapdoor middle with three apples below. Iron trapdoor middle with three orange tulips below. Wood on the top. Glass encircling purple dye. Stick-Space-Stick top, String-Yellow Dye-String middle, Stick-Bowl-Stick bottom. 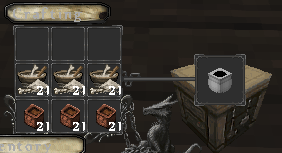 Milk on top row, Bonemeal on middle row, and Blaze Powder on the third... Yes. 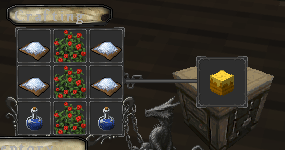 Bonemeal. Nine baked potattie. Fill crafting table. Green glass blocks on the sides and bottom, leaves and mundane potion in the middle. Iron half surrounded a milk bucket. Iron half surrounded a milk bucket with cocoa on the top row. Woof on the bottom, glass bottle in the middle. Iron ingots on top, leaves in the middle, and any coloured terracotta around the leaves. Leaves on top and middle, the rest orange terracotta. Leaves on top and middle, the rest purple terracotta. Leaves on top and middle, the rest magenta terracotta. Leaves half surrounded by purple terracotta. Leaves half surrounded by cyan terracotta. Redstone lamps surrounding a stick. Paper on top and bottom, and a torch between red wool in the middle. Stick-Slab-Redstone Lamp top, Slab-Redstone-Slab mid, Redstone-Slab-Stick bottom. 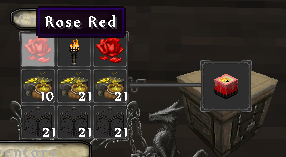 Iron ingots in corners, torch in middle, the rest red glass panes. 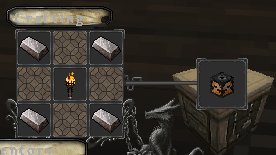 Iron ingots in corners, torch in middle, the rest glass panes. Wood on top and bottom, Redstone lamp in the middle, glass either side. Wood on top and bottom, glass on the sides, middle empty. 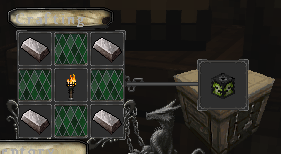 Iron ingots in corners, torch in middle, the rest green glass panes. Iron ingots in corners, torch in middle, the rest orange glass panes. 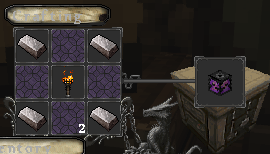 Iron ingots in corners, torch in middle, the rest purple glass panes. Blaze powder along middle and top left and right. Glass blocks bottom row. Torch top center. Blaze powder along middle and top left and right. Glass blocks bottom row. Blaze power middle row, glass blocks bottom row. Rose red top left and right, torch between them. Blaze power middle row, glass blocks bottom row. Rose red top left and right. Clay on bottom and left/right middle, ink in the centre, torch on top. Clay on bottom and left/right middle, ink in the centre, string on top. Wooden planks on top, then glass around a torch. Pumpkins with torches left and right middle row. Glass blocks surrounding raw fish with water potions on top. Wood planks with iron bars in the corners. Wood planks with iron ingots in the corners. Empty middle. Chest surrounded by rose red. Clock surrounded by wood planks. Clock surrounded by wood planks/logs. Diamond surrounded by chests and gold ingots. Leather on top and middle, oak planks bottom, iron ingot in the middle. Jukebox and chest in any order. Red wool on top, gold ingots middle, chests bottom. Blue wool on top, gold ingots middle, chests bottom. 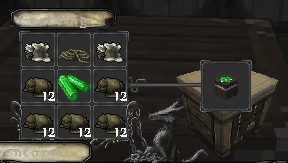 Green wool on top, gold ingots middle, chests bottom. Bookshelves on top and middle rows, oak planks bottom. Six books with green, red, and brown dye. Any order. Three flowerpots on the bottom, three [poppies] middle row. 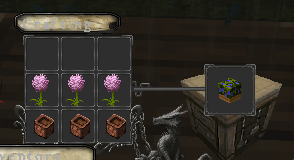 Three flowerpots on the bottom, three [allium] middle row. Three flowerpots on the bottom, three [oak leaves] middle row. 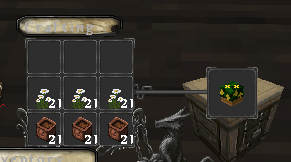 Three flowerpots on the bottom, three [oxeye daisy] middle row. Three flowerpots on the bottom, three [azure bluet] middle row. Three flowerpots on the bottom, three [pink tulip] middle row. 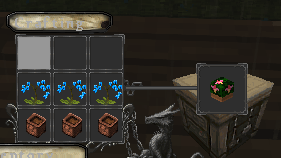 Three flowerpots on the bottom, three [blue orchid] middle row. 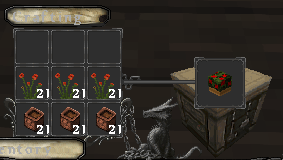 Three flowerpots on the bottom, three leaves middle, and three poppies on top. Quartz along the bottom, poppies middle. Quartz along the bottom, pink tulips middle. Quartz along the bottom, oxeye daisies middle. Sticks in corners, string in top, bottom, left and right, cactus in centre. Wheat on top and bottom, string in middle. Three flowerpots on bottom, three [bonemeal] middle row. Three flowerpots on bottom, three [cocoa beans] middle row. Three flowerpots on bottom, three [pink dye] middle row. Three flowerpots on bottom, three [lapis lazuli] middle row. Three flowerpots on bottom, three [ink sac] middle row. Three flowerpots on bottom, left and right, cocoa on top. Three flowerpots on bottom, left and right, cocoa on top. Water bucket middle. Iron ingots half surrounding gunpowder. 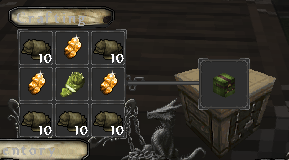 Iron ingots fully surrounding gunpowder. Cobble on bottom, iron ingots either side of lava bucket in middle. Torches on top and bottom rows, leads in the middle. Wood on top, sugar in middle and logs either side. Clay balls on top, sugar in middle and logs either side. 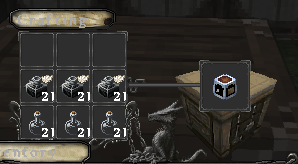 Chest in the middle with a lead on top, and string/paper around it. Check pic. Glass bottles on bottom, ink sacs on middle row. White glass blocks around the edge. Sticks, wheat, and string, in a scarecrow fashion. Leather on top, prismarine crystal in middle, green dye and rabbit hide alternating. Leather on top, prismarine crystal in middle, purple dye and rabbit hide alternating. 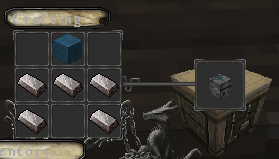 Iron ingots like making a helm. Blue wool top. 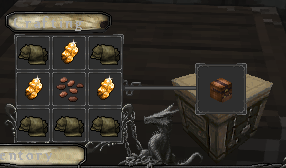 Iron ingots like making a helm. Light grey dye top. Iron ingots like making a helm. Iron block middle. Wooden planks like making a helm. Oak log middle. Pink wool top, light blue middle, lime green bottom. Light blue wool top, red middle, blue bottom. Light grey wool top, red middle, brown bottom. Gold nuggets along left, bottom, right. Lapis centre. 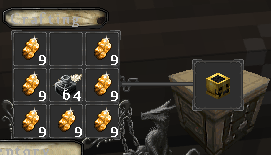 Gold ingots along left, bottom, right. Redstone block centre. Gold nuggets along left, bottom, right. Ink sac centre. 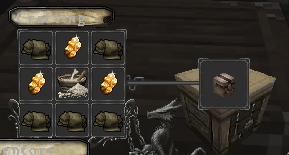 Gold ingots along left, bottom, right. Apple top, Lapis centre. Gold ingots along left, bottom, right.Diamond centre. Sticks in corners, string left and right, bowl bottom. Four pieces of chiselled quartz block. Four pieces of pillar quartz block. 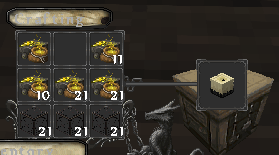 Three gold ingots on top, gold block in middle. String in the upper left and right, roses in the middle, and the rest white wool. String in the upper left and right, roses in the middle, and the rest brown wool. Black and white wool alternating with wood planks on bottom. 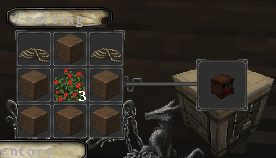 Six clay balls and three [bonemeal] in any order. Six clay balls and three [ink sac] in any order. Six clay balls and three [rose red] in any order. 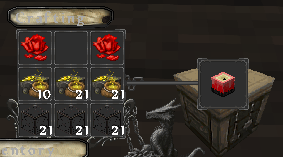 Bone blocks, red stained glass, and bones. Oak wood with flint in the middle. 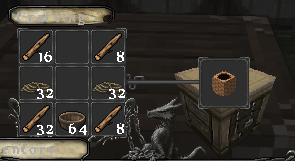 Leather on top, wood below, [nothing] in middle. Leather on top, wood below, [cyan dye] in middle. Leather on top, wood below, [rose red] in middle. Stone and flint in a pattern. See pic. Leather, rabbit leather, string, radiants. See pic. Just see the picture I'm lazy. Just see the picture I'm lazy. That has cactus green in the middle. Just see the picture I'm lazy. That has bonemeal in the middle. String on top, bottom, and one in the middle. Oak Log in the middle, with an axe below and vines to the right. A variation of stone, cobble, and stone slabs. Glass panes on bottom and left/right middle row. Cocoa beans in centre, topped by wooden slab. Glass panes on bottom and left/right middle row. Sunflower in centre, topped by wooden slab. Wood planks top, glass blocks bottom and middle left/right. Fermented spider eye middle. Glass panes on bottom and left/right middle row. Red tulip in centre, topped by wooden slab. Wood planks top, glass blocks bottom and middle left/right. Glass panes on bottom and left/right middle row. Blue orchid in centre, topped by wooden slab. Glass blocks surrounding redstone block with a wood plank on top. Glass blocks surrounding raw beef and redstone. Light grey panes surrounding light grey wool top centre and raw porkchop middle. Wood planks top, glass blocks bottom and middle left/right. Glistening melon middle. Trapdoor centre top. Glass panes bottom and middle left/right. Redstone in middle. 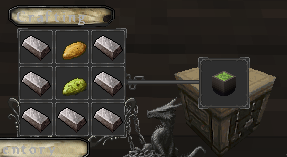 Iron ingots on left, bottom, right, with a potato above a poisoned one in the middle. Elz you saint i was just compiling a list of these on my computer and it was hard figuring out the flowers, I still don't have red or blue azelia's yet. 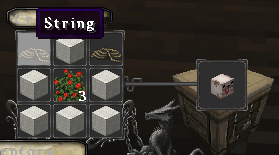 Edit: If it saves youtiem i have a lot of screenshots of craftintgg recipies in vanilla, i know testurepacks can confuse some people about what an item is sometimes. I aim to go through and make some image packs or bundles and list the items too, but if it gets too crazy I might just accept help from people and hyperlink it by each one. We'll see, thankyou though! Since I'm a bit busy at the moment and will be for a while, I'll accept screenshots like what I've included in the posts and I'll add them in! It is updated. That took a long time. There may be things I'm missing from recent releases, if so, poke me on discord or something and I'll try fix. Oh. Bless you, you sweet woman.